Great location downtown centre of Aberdeen within minutes walking distance of several restaurants, bars and shopping. A great place to stay in Aberdeen. 20 Minutes away from Aberdeen by taxi..
Where to find Aberdeen hotels near an airport? 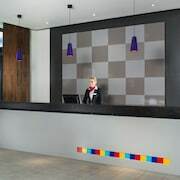 How can I find hotels in different Aberdeen neighborhoods? Where can I find hotels in Aberdeen that are near tourist attractions? If you are wondering where to base yourself in or around Aberdeen, there's a wide assortment of suitable possibilities. The Expedia database features 79 hotel options within a 0.1-kilometre (0.06-mile) distance of Aberdeen's central area. 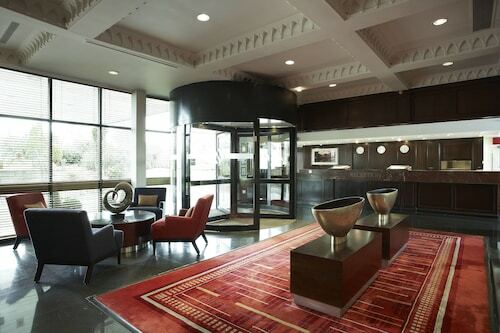 Within a 1-kilometre (0.6-mile) radius of Aberdeen's city center, visitors can enjoy a selection of hotels, such as the Aberdeen Douglas Hotel and Rox Hotel. Dyce is an accommodation neighborhood that is situated 8 kilometres (5 miles) from downtown and offers 6 Expedia-listed hotel options. 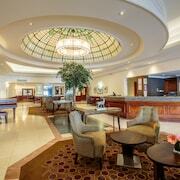 Dyce places to stay are the Aberdeen Marriott Hotel and Courtyard by Marriott Aberdeen Airport. 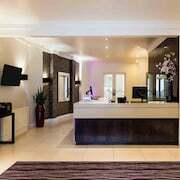 The DoubleTree by Hilton Aberdeen City Centre and the Skene House HotelSuites-Rosemount are both conveniently near King's College. 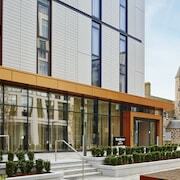 The Bauhaus Hotel and the The Craibstone Suites are near University of Aberdeen. The Aberdeen Art Gallery and the Royal Aberdeen Golf Club are two more popular Aberdeen attractions. 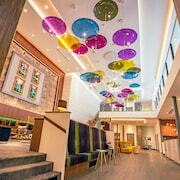 The Skene House HotelSuites - Whitehall and the Micasa ApartHotel are near to the Aberdeen Art Gallery. While the Holiday Inn Aberdeen - Exhibition Centre and the Holiday Inn Express Aberdeen Exhibition Centre, are near the Royal Aberdeen Golf Club. The Expedia team understand that travelers have different budgets. 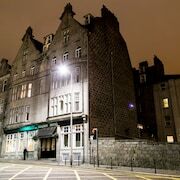 So if you are searching for accommodation at the cheaper end of the range, the Aberdeen area boasts some nice options to choose from. The Carmelite is 0.1 kilometres (0.1 miles) from the main part of Aberdeen, while the Parkhill Apartments Hilton Campus is 2 kilometres (2 miles) away. The Skene House HotelSuites - Holburn and the Soprano St Magnus Court Hotel are some more economical places well worth looking into. 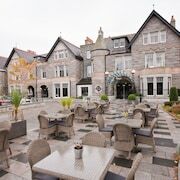 The Meldrum House Country Hotel & Golf Course is located 25 kilometres (16 miles) from the main part of Aberdeen. Another alternative is the The Mariner Hotel, which can be found 2 kilometres (1 mile) away. 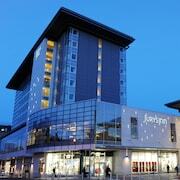 Alternative hotel options include the Britannia Hotel Aberdeen and the Hilton Aberdeen Treetops Hotel. Why don't you take the time to broaden your horizons and check out the many other attractions of Aberdeenshire and Moray while you are here? Investigate Aberdeenshire and Moray's ruins, castles and traditional villages or enjoy the area's beaches, coastal plains, forests and rivers. Fun-loving visitors might enjoy snowboarding, skiing and tobogganing here. Ballater is 60 kilometres (36 miles) to the west of Aberdeen and is home to the Ballater Golf Club and Loch Muick. Some of our recommended Ballater hotels and accommodations are the Hilton Grand Vacations at Craigendarroch Suites and The Deeside Inn. 95 kilometres (59 miles) to the northwest of Aberdeen, you'll also find Lossiemouth, which is home to the Links Lodge - B&B and Stotfield Hotel. The Moray Golf Club and Harbour Treasures are a couple of the most popular attractions to experience in Lossiemouth. Dyce Airport is a convenient airport for flying in and out of Aberdeen. It is 9 kilometres (5 miles) away. If you choose to stay nearby, try the Craighaar Hotel or Speedbird Inn. What are the most popular Aberdeen hotels? Are there hotels in other cities near Aberdeen? What other types of accommodations are available in Aberdeen? Explore Aberdeen with Expedia.ca’s Travel Guides to find the best flights, cars, holiday packages and more!